When you’re burdened with a lot of student loan debt, it can be difficult to make your monthly payments. Unfortunately, one of the worst things that can happen as a result is defaulting on your student loans. 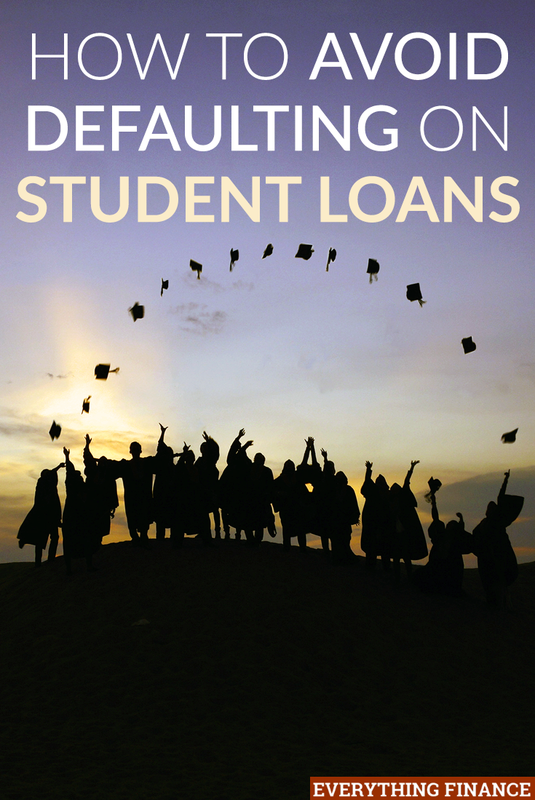 Defaulting on your student loans comes as a consequence of missing several payments. It can happen to anyone who doesn’t keep up with their payments for a certain period of time and fails to communicate with their lender. With the national student loan debt amount reaching the trillions, it’s no secret that some graduates are saddled with quite a bit of student loans. What Does It Mean to Default On Your Student Loans? Ignoring your student loan debt won’t make it go away. If you fail to make payments for more than 270 days without contacting your lender or attempting to get back on track with payments, your loans will most likely go into default. Before taking any loans, try tackling or study all The Pros and Cons of an Unsecured Loan, it will help you a lot. Defaulting on your loans is bad for several reasons. First, if you go into default, you’ll be subject to paying all of your late fees and your credit will take quite a hit since your lender has to report your lack of payment. Payment history is a crucial factor in regards to your credit score, so imagine how 270 days of missed payments will look once it’s stuck to your credit report. Going into default also means you’ll be ineligible for any student loan forgiveness programs in the future, and you may have to deal with collection fees from the collection agency that will be handling your account. Lenders can even take legal action against you and sue you for not paying back your student loans. The government can also garnish your wages. To be on the safe side, it’s best to avoid defaulting on your student loans at all costs. If you are struggling to make payments or have already missed a few payments, here are a few ways to avoid defaulting on your student loans. The first thing you should do once you leave college and get settled is to look into your student loan situation. It’s important to determine who your lender is, the total amount you owe, what your interest rate is, and when your grace period is over (if that applies). It may sound surprising, but some people may not know the amount of loans they took out for college. If this is the case, how will you know how much you need to pay back? If you don’t know how much you owe and who you owe, you could easily start missing payments or think you paid a loan off when you didn’t. This is why it’s crucial that you write all this information down in a safe place along with the terms of your payment plan. If you feel like you can’t handle your student loan burden, it’s important to reach out to your lender. Student loans go into default when the borrower stops making payments and doesn’t contact the lender or respond to their warnings. If someone asked you to loan them money and then they never showed up to pay you back, you’d be a little worried, too. Right? If you keep in contact with your lender and explain your situation in detail, they may be able to help you and offer you some solutions or student loan relief options. Speaking of student loan relief, there are quite a few options available if you have federal student loans. If you lose your job or can’t find a job right after college and can’t afford your loan payments, you can apply to put them into deferment or forbearance. Student loan deferment is a period in which your student loan payments are not required. Interest may still accrue on your loans, but you don’t have to make payments for the time being. During a period of economic hardship or unemployment, you could defer your loans for up to three years. Not everyone qualifies for this option, so you must apply first and demonstrate economic hardship to be considered. When my husband got laid off from his job last year, I recommended he apply for deferment so his student loans wouldn’t go into default if we couldn’t afford to make payments on them while he was out of work. Forbearance is another student loan relief option for borrowers who don’t qualify for deferment. Forbearance can stop your student loans payments for up to 12 months. Like with deferment, you must request forbearance. No one knows you’re in need of assistance if you don’t speak up. If you are suffering from an illness or need time to get your finances in order so you can make payments on your loans in the future, you can request forbearance from your lender. In some instances, they may be required to grant it to you. If you have private loans or don’t qualify for deferment or forbearance, you may be able to lower your interest rate or your minimum payment by refinancing or consolidating your loans. Consolidation involves combining multiple student loans into just one loan. By rolling all your loans into one, consolidation will simplify your debt. You’ll have fewer bills and payments to keep track of each month. Plus, since consolidation averages out your interest rate, it could slightly lower your new interest rate, and in turn, that could lower your monthly minimum payment depending on how your student loan payments are allocated. Refinancing, on the other hand, involves taking out a separate loan with new terms through a new private lender to pay off your old loan balance. Refinancing is a great option if you have high interest rates for your student loans or a variable interest rate. However, unlike consolidation, refinancing can only be done through a private lender, so if you wish to refinance your federal student loans, you will no longer be eligible for federal student loan relief benefits like deferment if you ever need it in the future. Finally, one of the best things you can do to avoid defaulting on your student loans is cut some of your expenses so you can afford to make payments on your loans each month. If you are able to get deferment or forbearance, you can save up an emergency fund, if possible, while your loan payments are on hold to act as a financial buffer should you ever run out of money. You can cut your living expenses by moving back in with family to save money on housing, or you can get a roommate. You can also rely on public transportation instead of your car if it’s cheaper, stop dining out as much, get a cheaper cell phone plan, and create a budget that allows you to afford basic necessities and your loan payments. All in all, you have quite a few options when it comes to avoiding default and making consistent payments on your student loans. Remember to weigh all your options and stay in communication with your lender so you can find the right solution that works best for you. Do you have student loans and have you ever had trouble making monthly payments? Have you taken advantage of any federal programs to help ease the burden?